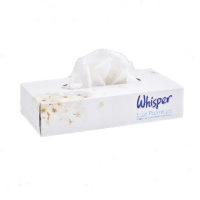 Facial tissue, paper handkerchief, and Kleenex all refer to a type of soft, absorbent, disposable paper that is suitable for use on the face. They are disposable alternatives for cloth handkerchiefs. The terms are commonly used to refer to the type of paper tissue, usually sold in boxes, that is designed for nose-blowing and around the face. They are also popular with service industries such as hairdressers, beauty salons or dentists where complimentary paper tissue is issued to customers to assist in cleaning themselves up after the work or procedure is completed.